This week, there are so many premieres happening at once: (1) Summer has a fulminant start in Germany this weekend with temperatures crossing the 30° C mark for the first time today (2) I am doing my first ever drink recipe on the blog, and (3) I am doing it in German for the first time since I started writing brag&butter in November – not here, but on the German blog Konsumbude, where (4) I am guest-blogging for the first time! Yve from Konsumbude found me online and invited me to join her for a special on summer drinks. All pretty exciting, and so my Rosemarycano sundowner is the perfect drink to launch summer as well as my celebration cocktail! My favorite season is regrettably also the shortest one: although I like summer in general, I LOVE high summer. The few weeks around mid-August, when the sun is blazing and the air is flickering, when all of nature has reached its full potential and the grass and everything on the fields is almost scorched, when the asphalt begins to smell of stone and the tar starts to melt in the streets – that is MY summer. This weekend, there is the first taste of it in Germany. And to go with it, I came up with my new favorite sundowner for you. The thing I love most about this time of year is the life and liveliness outside, in the streets of the city. When in the first shade provided by the hesitant dusk, crowds of people swarm into the alleys of the old town of Mainz or onto the banks of the Rhine, populating terraces and just enjoying life al fresco with an uncomplicated bite to eat, a glass of chilled white wine or apple wine (called ‘Schobbe‘ around here), chatting and laughing away. Life outside does something to people. And I like what it does. I love being right in the middle of it when, pleasantly exhausted by the heat, people find other topics than their usual jobs, bosses, and projects! projects! projects! This kind of Italian Dolce Vita has always been more my kind of summer than neon-colors, Pina Coladas and waterski. Summer in the city has something about it (above all style), and twice as much in an Italian city. So when Yve asked me for a summer drink, I immediately began to think about what I would love to drink on a summer night somewhere in Italy. Basically, my Rosemarycano is a classic Americano, which is equal measures of Campari and red vermouth with a splash of soda water and an orange slice. For as long as I can remember (and legally drink) it has been my go-to drink. I love it for almost any occasion because it’s aromatic yet fresh, and it doesn’t contain too much alcohol (which can always and easily be fixed by switching the soda water for gin and turning it into a Negroni). For my summer version I’ll twist it around with my two favorite summer flavors: lemon and rosemary. The woody aroma and slight eucalyptus-like freshness of the rosemary goes very well with the complex aromas of Campari, and the lemon adds another ray of sunlight and lifts the whole thing. And just because I fancy it, I switch the soda for tonic water – Salute! Cut the lemon in quarters and squeeze them directly into the glass, making sure that the essential oils from the zest hit the glass. 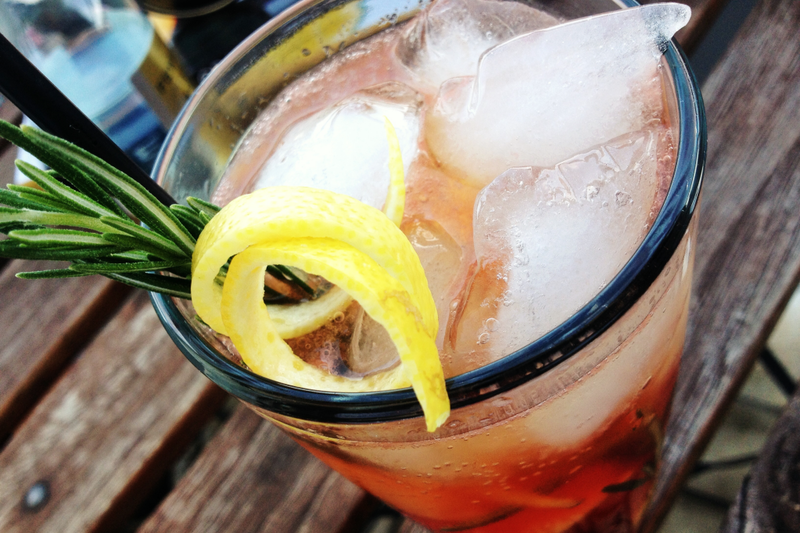 Rub and twist the rosemary between your hands to release the aromatics and add to the glass along with ice cubes. Add Campari and Antica Formula and fill with Tonic Water. Stir vertically once with a long spoon. 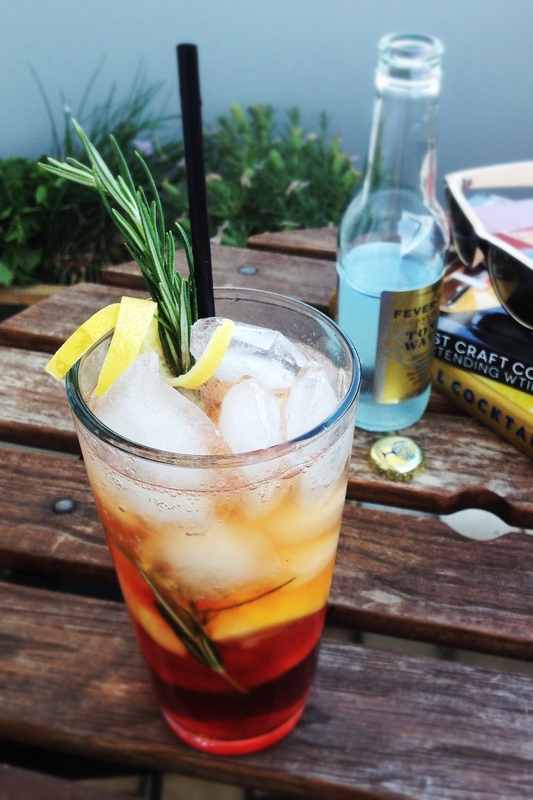 A rosemary sprig and a lemon twist go well as garnish. First time on your blog!! Beautiful photography!